Update: He added another event in Miami today. 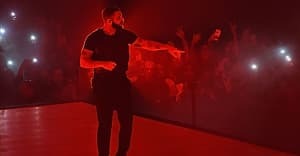 Drake continued to raise anticipation for his Views From The 6 album today, sharing details for an event taking place in New York City this afternoon at 4 p.m. The rapper posted an address (135 Bowery), date, and time on Twitter. He also announced that the event is a collaboration with Beats By Dre. As of now, that's all there is to go on. Views is due April 29. Update, 4/18/2016, 3:00 p.m.: Take an early peek inside the pop-up, thanks to Instagram. A few shots from inside the Bowery pop-up show a giant Views logo and racks of black Views t-shirts. In 2013, Drake also promoted Nothing Was The Same with a surprise pop-up shop on the Lower East Side, where he gave away NWTS tees. Still no word, however, on what Drake has planned for this afternoon. Update, 4/19/2016, 3:50 p.m. Drake added a pop-up in Miami. Following yesterday's Views promotion on Manhattan's Lower East Side, Drake announced a companion event in Miami. This one takes place at 500 NW 23rd street at 5 p.m. Read The FADER's recap of yesterday's pop-up.